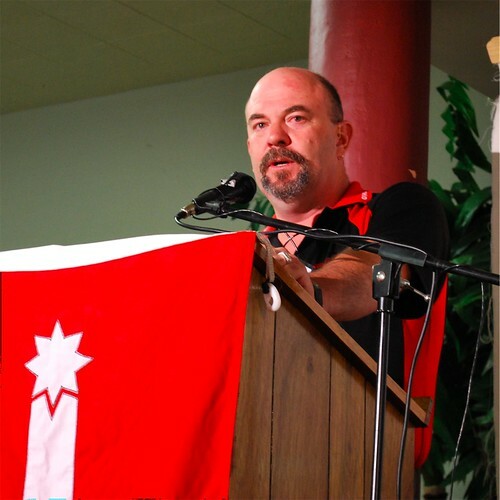 "Geelong Trades Hall Council backs Australian Workers Union national secretary Paul Howes 100% in his call for Australia to roll out the red carpet for refugees", Tim Gooden, the GTHC secretary said today. (Pictured right). "It's a relief that a union movement figure of Howes' importance stands up and rejects the miserable competition between the Rudd government and the Coalition on who can be 'toughest' on people smugglers", Gooden added. "Howes is completely right when he says that the issue 'brings out the worst in our politicians'." "How ironic that the Rudd government's refusal to let a few boatfuls of people fleeing death and persecution in Sri Lanka enter Australia coincides with the 60th anniversary of the beginning of the Snowy River Scheme," Gooden said. "The Chifley Labor government helped build this country by welcoming people fleeing war and persecution, but Rudd Labor increasingly resembles Howard's, one of the most racist in Australian history." "It's even reached the point where it is sending demountables from the Baxter detention centre--suspected of dangerously high formaldehyde content--to Christmas Island to house asylum-seekers there." "The Geelong Trades Hall Council calls on the entire trade union movement to follow the lead given by the AWU national secretary, and for it to mobilise public opinion against Canberra's bi-partisan bullies of refugees."